Well folks, it is a new month. Anyone that has been around this blog for a while know that means the post quota counter on the wall gets reset to ZERO. It is a bitter sweet event. It brings with it the personal satisfaction of completing another successful month of blogging but it also means four more weeks of fretting about getting new material out to my loyal readers. However, this time I am in a very good position – drum roll please …. thanks to a lot of hours in front of this computer I can announce the image queue has been trimmed to January 2016. That’s right, this photographer is now only a bit more than 2 years behind (champagne for all). Takes a lot of pressure off when you easily have 2 year’s worth of post material just waiting to be introduced into the world. Let’s get to it shall we!?! So we all know the old saying, March comes in like an evil demon and exits like a cute and cuddly baby chick. In honor of it actually being March (you’d almost think I plan this stuff out), thought it would be fitting to feature …well… an evil demon of a bird. I’ll be honest with you, today’s featured bird scares the crap out of me. It scared me with I was looking through the glass when the pictures were taken, it creeped me out when I was processing the pictures in the digital dark room and looking at it right now makes me want to go find my childhood plush dog, grab a carpet square and ball up like a baby on my den floor. In case you are wondering my constant toy as kid was a golden colored Snoopy looking stuffed toy named Henry (don’t laugh, but I still have it sitting on the top shelf of my closet). Wow, how did I get on this…back to demon spawn. 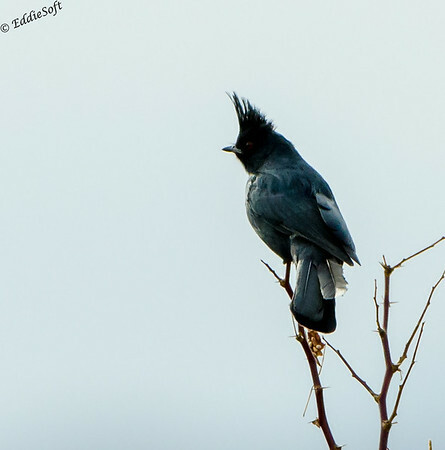 Hit the jump to find out what this crested specimen is. This scary specimen was shot on the trails behind the Corn Creek Visitor Center outside Las Vegas, Nevada. We were out there to bring in the 2015 New Year and had the opportunity to head out to the Mojave Desert area to do a little birding. 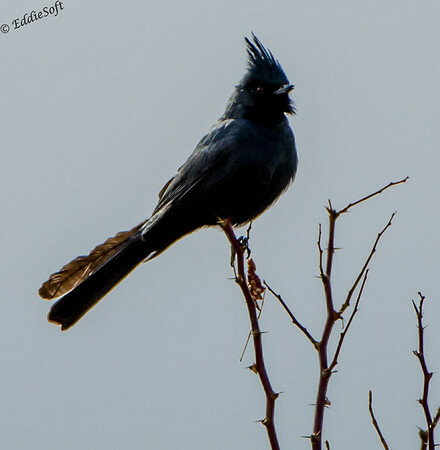 One of the featured birds in the area was something called a Phainopepla. Cannot count the number of times I’ve been to a place advertising a unique birding experience only to head home without getting it in the tin. Clearly you can tell this was not the case here. Apologies though, the specimen we found was positioned in some horrible backlighting. The trail layout made it impossible to improve on the angle so left to cope with exposure issues and massive cleanup in the digital dark room. At least there is no doubt on the ID. 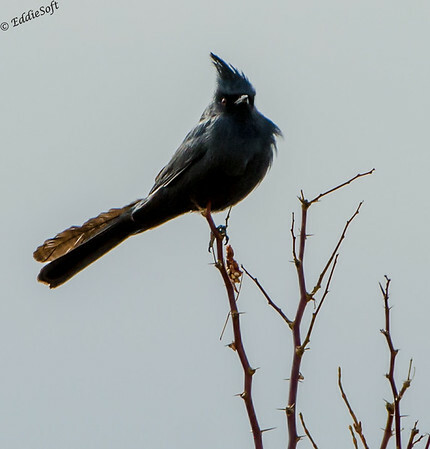 Interesting enough, Phainopepla is Latin for “Evil Cardinal”. Thinking it would have been even creepier to have Brandon Lee paired with a Phainopepla instead of just a Crow. Oh no, almost out of shots. Let’s find some interesting facts to share. First off, they can mimic other birds when being attacked by predators (including humans). While we were there, this one was sticking with its standard twill – in fact, it is due to this odd twill that we were able to locate it hanging out in the tree (thought it was an insect at first). They are extremely territorial in their desert habitats (becomes more neighborly in the woods) and get this, rarely drink water. Cornell indicates they rely on their diet of Mistletoe to provide their fluid intake. Wait a minute, wait a minute… STOP THE PRESSES. I might have incorrectly stated what the name means. Sorry folks, it is not Latin for Evil Cardinal. Nope, the word is actually Greek for “Shining Robe”. Your choice, cheesy clothing reference or forbidding child of the dark – personally, I’m sticking with the dark reference. Now back to my carpet square! Ah, Henry!! I didn’t know you still have him. Named after a clown, as I recall. 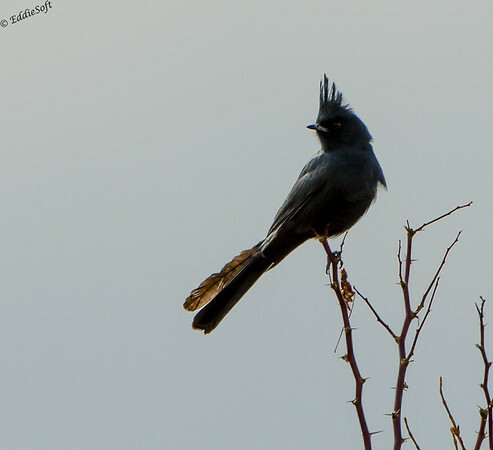 I had never heard of a Phainopepla until you showed me these pics. How strange, and what a strange name for a bird. Surely it would have been replaced with something that doesn’t sound like a skin condition. It certainly is a scary-looking bird. Thanks for a brand-new bird. I’ll have to look (or listen) for one of these when I’m in Southern California in a couple weeks. I see that its range extends just up through that area and, oddly, in a finger that runs all the way up the center of the state, and also just into Nevada where you took these pics. I see that you caught its red eyes, too, making it look even scarier. Nevermore! HE WAS NOT NAMED AFTER A CLOWN! How dare you accuse my boyhood companion of being from an evil cult. Great, now every time I see this bird (or its name in the reference book) I am going to immediately think skin condition. Wait a minute, haven’t we already discussed the whole California trip. If you are going out there to see your daughter you cannot claim any +1’s because they would simply be incidental to the real purpose. I feel bad for you, but rules are rules. Oh, get this, I was at a photography seminar today with well known photographer. Towards the end he had a story (complete with pictures) of taking advantage of an opportunity to photograph a bird that had broken its neck on a window – he got out his macro, pinned the wing open with a rock and sprayed water on it in order to get a stunning texture shot. Linda commented on the horrified look on my face. Good Lord, that photographer’s story is horrifying. But just as a hypothetical, would that be allowed under our birding rules? Maybe if I were trying to help the bird wake up with the water mist?? NO – ABSOLUTELY NOT. You are allowed to try and revive the an unconscious bird. I personally find that if you get to a bird that has knocked themselves out on a window (say within 2 minutes) and roll them back onto their feet there is a good chance they will recover – say in the 80% range. If you don’t get them back on their feet they tend to fade out – by on their feet I mean feet side down, they will be too weak to actually stand. You may ask how I know… let’s just say I have a lot of windows in my house. You are welcome to try the mist option – and option unexplored at this point, but anything to bring it back would be step in the right direction… you just can’t take a photograph of it beyond a final shot long after it has passed away as remembrance and something to possibly answer any curiosity of what it might have been. Also nice if you could bury it in the backyard and maybe put a little stone by it to keep those damn cats away hehehe.